A gathered collection of some of my favorite things. An old wood box found in a small town in Texas, a vintage quilt from Massachusetts, and a Japanese plate found in a thrift shop in DC. 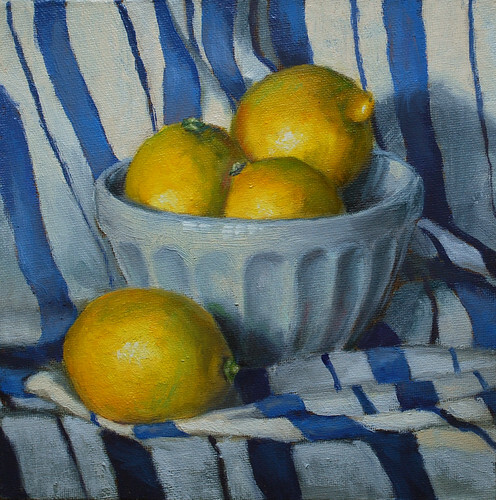 And lemons, one of my favorite fruits to paint. This painting is going home to a very special person, it was made especially for her after she shared with me that her favorite fruit were lemons. This painting was created in the late afternoon when the light coming in through the windows was touched with a golden sheen, making the lemons almost glow. 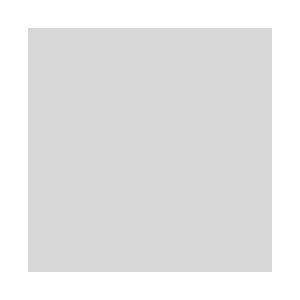 Do you have a special something you would like interpreted in paint? If so please feel free to contact me about your idea, contact [at] elizabethfloyd [dot] com. The week has gone by so fast! How is it already Thursday? Well, never mind… I hope your week has been going well. Mine has been disproportionally filled with yard work, clearing debris caused by the three snow storms we had this winter. Before starting in on the lawn work, some time was dedicated to painting where I completed this little gem. I love the kitchen dishcloth motif and playing with how stripes give a sense of space in a painting. It was nice revisiting this theme again. It was painted only with natural light, so during the first setting I was racing the clock and ended up painting in such darkness it was almost impossible to see the palette. I kept at it as long as I could because I did not want to lose that initial impression and excitement. I am pretty beat today and hope you had a nice one. It is at times like this that I realize how important sleep is for keeping creativity up. So will I will keep it short. Over the last two weeks I have worked and reworked the lemons in certain paintings. This is because I sometimes get hung up on the subtleties of the colors in the shadows, is the shadow really that green or purple, or a compilation of the two, or maybe something totally different. So today’s painting is also lemons as I continue to work on discerning these slight changes in color and value. Before completing this painting and the previous one I did some 10 minute studies of each setup on some gessoed watercolor paper. I got this idea from Carol Marine’s blog where she had her recent workshop students complete various 10 minute sketches. Working with a timer really gets the blood pumping and enhances focus. Once I got down to painting the real painting I felt familiar with the subject and had some experience exploring some different variations of how to apply the paint and accomplish what I wanted to. Lately I have been using cremnitz white more often than the other whites on my palette, titanium white and zinc buff white. So for the drapery folds I decided to only use titanium white and to play with its fluidity. How was your weekend? My weekend went by fast, it was filled with watching movies, trying out new recipes, and working on some different art projects. I was fortunate enough to finish a few paintings which I am really excited about showing them to you, however they are gifts, so I will wait on sharing them until after they have been received. I also started thinking about getting back into the daily painting thing. The last one was completed on Sept. 7, 2009, and the next day I left for a trip to Texas and when I returned, my focus was on larger paintings. Which was a nice change, working with larger compositions as I was able to fiddle with new ideas and painting techniques. The down side of this change in focus was that I got out of the groove in completing the smaller daily paintings. During this time off from I spent some time assessing how I value my time and if it would be a good idea to increase the starting bid on these smaller paintings that go on auction. After thinking about it, discussing it with some valued patrons and friends, I realize it is time to increase the prices. This increase will cover my expenses and also the time spent on these paintings, which is necessary especially as I am now a professional artist. Prior to this point my goal with the daily paintings was to just cover the cost of materials, this was not a sustainable system. I want to be happy and excited when working on daily paintings not regretting the time that could be spent on other pieces. I also want my work to be valued, so after much deliberation today’s daily painting will be at the new starting price. I want to thank you who have supported me so far and those who have helped me in making this decision. PS. I will be back soon with some of the gift paintings. I finished this one just in time as I am heading out on a trip tomorrow to western Washington to visit with family and spend some time on Lake Roosevelt. This is my first trip flying with an oil painting kit, and I am looking forward to completing a painting or two while out there. The sunsets in western Washington are spectacular. This painting has been on the easel for several weeks now and is the third large-ish painting I have completed this month, they were all started the second week of July (here are links to the first and second paintings). The pottery is borrowed from my friend Chrish, who at one time lived in Morocco. The pottery is so beautiful and all are handmade with the slight imperfections of handmade items. Like the rims are not exactly even and the pattern changes as it goes around the bowl making up for anything omitted or extra. The traveling trunk was given to me by my love, he found it a few months back and knew I would like it as a still life item. The trunk has old worn out leather and brass bits, the canvas coating is worn in places and torn in others. And on the sides there are several old travel stickers from the different destinations it was taken to. With this painting I have been experimenting on working with layers and glazes. Last year when I was taking a painting class from Danni Dawson, she spoke about the textural differences between painting alla prima versus slowly layering and building up a painted surface. For the various parts of the painting I would block it in and then would go back to refine and rework an area, always striving to add a greater sense of depth and quality of light. The painting relied on bright indirect natural light, so on the cloudy, overcast days no painting occurred, I worked on other projects. Here is an example of an area that was first blocked in and the final outcome with the various layers. I am really knocked out by the base of this bowl, the reflected highlights and the modeling of the white glaze at the bottom rim. This is what is supposed to happen when working with all the extra layers and in the end it is worth all the time dedicated to a single painting. Lately I have been beat by the end of the day. I so enjoy writing about the creative process and what I have been focusing on, though recently I have been mentally too tired to articulate what has been going on in my brain while painting. I think this is because I am currently juggling several different projects while also striving to maintain frequent postings of “daily paintings”. In the future there may be times when I only post an image and basic information about the daily painting. When my verbal side of the brain is in sync, I will share more with you about the process. Today’s painting was started on Thursday, but the light faded before completing it. This afternoon, I changed the setup slightly and started over. I think having a few days to contemplate it helped out, deciding to lighten the foreground some and capturing the lavender in a more impressionistic method rather than being too literal in copying reality. I also made the entire painting more high key in value, to emphasize the feeling of summer and sunshine, two things that lavender and lemons remind me of. Hello,Most of Sunday afternoon was spent completing this painting. It was set up to use only natural light and being that we are scheduled for some cloudy days ahead I was eager to complete it with a sunny outside, the same lighting conditions for the first few phases of the painting. In other news over the weekend I found out that the 2nd floor of Artomatic was reviewed by Kevin Mellema of the Fall Church News Press in the Northern Virginia Art Beat column and my work was mentioned. This is my first experience receiving press, and it is kinda exciting. Here is the article. Here is a detail of the rice bowl. Today I worked on this painting in the morning as a warm up before working on a larger still life begun over the weekend that also has lemons in it. I find as time goes by I get more and more interested in capturing the nuances of color and value. Lemons are particularly interesting in that the shadow side is dark, with hints of purple and green in it, though the reflected light in the shadow shape is lighter in value but kinda vibrant in color, not desaturated like the rest of the shadow area. Thank you for the kind comments regarding my back injury. I did manage to complete a small daily painting today even though my back and sciatic pain is still limiting my time at the easel. Has this ever happened to you? When not feeling well, does it affect your ability to see and capture color? I think it does for me. Yesterday I tried to paint some, but ended up wiping it down. For the past few days I have been going on walks due to limited time at the easel while out I have been taking some photos and posting them here. Bright paintings always cheer me up. For this painting I wanted to paint something that was a challenge and also colorful, so lemons and a bright checkered cloth was just the right. This was a great way to end the weekend. How did your weekend go? Yesterday with a day off was spent painting. I am looking forward to when painting during the week is a regular occurrence, but now it is just a luxury I savor. For this painting I thought it would be fun to paint with an analogous palette of blue, green and yellow. Occasionally I would mix in red to either knock the saturation of a color down, or with the white bowl, to create a color vibration off of the predominating colors in the painting. This is an exercise I am going to play with more in the future. This is the first of two paintings I painted today. I was working to create diptych where the individual paintings have a solid composition alone and then as a pair. Tomorrow I will post the close up of the second painting. Painting lemons has been a focus of mine for a few months. Each time I paint them, I learn something new. My ability to observe and understand them has increased, so I am now starting to investigate how to capture the translucent interior. Cutting a quarter wedge out of the fruit was a way to emphasize how light transmits through, and how the white of the rind is quite reflective. I find great satisfaction in painting lemons. I love how the shadows go green, sometimes blue and occasionally a violet color will lurk in the shadows. The transition between light into shadow is also a mystery, the end result depends on the light and surrounding colors. Every painting is a new adventure and fun challenge to solve.